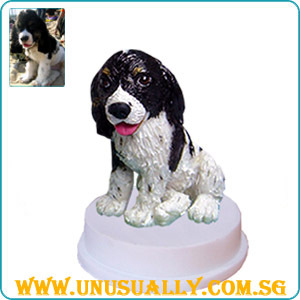 * As this is a 3D caricature figurine, we promised our customers a 60 - 70% resemblance to the photo supplied but not the real person as artists refers to the photo to hand-make the dolly. * Basically we can do any custom pets. Ranging from dogs, cats etc. Just tell us what you want and we will create for you. * There will be 3 sizes option for you to choose. * Prices quoted here is only as a guideline. Usually for full custom pet, prices will range between SGD 188 - SGD 248. To confirm on the prices, feel free to contact us or drop us an email to request for a quote. * Standard order process for fully customized figurine will need around 28 working days upon submission of photo to us. If process as express order process, it will still require around 21-22 working days. * For standard order process for fully customized figurine, we will provide customers with FOC sculpted head & body proofing for approval before we baked the head & body of the figurine. This additional process provided will be to protect customers interest so to ensure that the done up figurine resemble to the person's photo will be there. DO TAKE NOTE THAT NO PROOFING PROCESS WILL BE PROVIDED FOR EXPRESS ORDER PROCESS.